As Seen in Navarre Press.. The team at Air Conditioning One knows what it's like to have an air conditioner quit on the hottest day of the year. Roger Rogers and his crew have been in the air conditioning and heating business for more than 16 years. Roger knows that folks on the Panhandle need a reliable, affordable HVAC team they can trust. 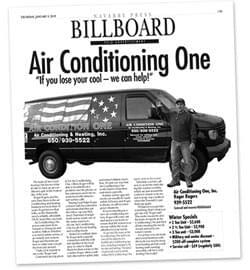 Air Conditioning One serves customers from Navarre to Pensacola and north to Milton. Whether you need routine service or an entirely new system, Roger and his team are here to make sure you get the best care around. "I take a lot of pride in my work," Roger said. Customers are top priority for Air Conditioning One. Often, Roger will be able to troubleshoot a problem over the phone, so his customers aren't inconvenienced with unnecessary service calls. Staying local helps Roger connect with his customers and ensure that they get the follow-up care they need. That kind of neighborly service is just one of the many reasons to choose Air Conditioning One for all of your heating and cooling needs. Raised in a military family, Roger feels a special connection with the military families in the local area. In order to thank them for their service to the country, Roger offers a military discount for active duty and retired military members. It's just one way that Air Conditioning One works hard to keep their customers a priority. Routine service appointments can usually be made within 24 hours, and Roger is always on call for emergency situations. If you're investing in a new air-conditioning system, Roger will come out and assess your home to ensure that the system you choose will be the most effective for your needs. Roger and the team at Air Conditioning One will look over all the aspects of a healthy air-conditioning system, including insulation, filter size and wiring. This kind of personal touch is what makes Air Conditioning One stand out from the crowd. Schedule a service call now to avoid the rush during the warmer months, which are just around the corner, to ensure your system is in tip-top condition when the Emerald Coast heats up again. "Whatever you put into something, that's what you get out of it," Roger said. This motto means he and his team of experts at Air Conditioning One put their all into meeting the needs of each and every customer's needs. For service you can trust, and a local business with the tools you need to keep your heating and air conditioning units running smoothly, call Air Conditioning One today!